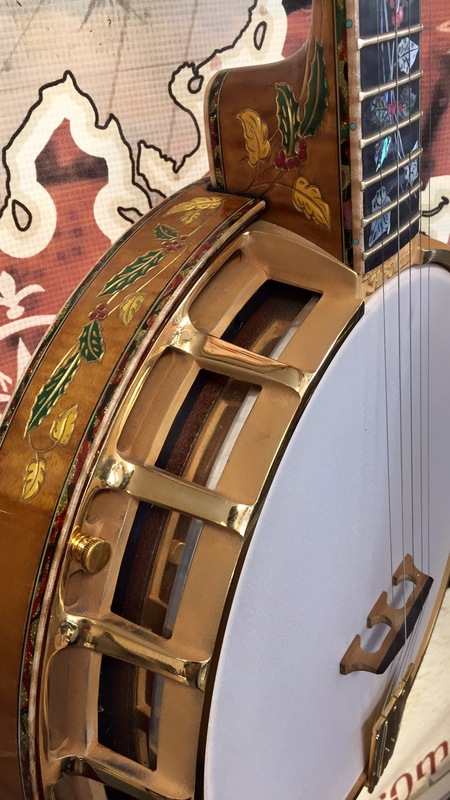 Here Nechville has combined his now famous Helical Tone chamber mounting, or Heli-Mount construction, with specially selected old-growth woods and spared no expense in adding the festive details that make this banjo so happily cohesive as an instrument. Merry, the holiday banjo was originally inspired by a gift of sparkly Christmas tree binding made by noted banjo artist, Greg Rich. Since Tom liked playing Christmas music, he decided to make a banjo that would depict Holly and Ivy rather than candy canes and Santa Clauses to create a flowing natural design. 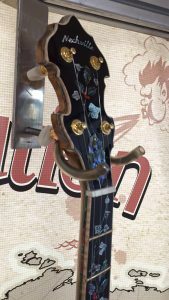 He hired inlay design by Ken Bennett to create the fingerboard and headstock artwork. 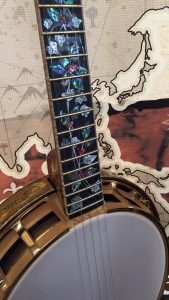 The level of detail on the inlay gave rise to the need for some modest carving and color on the neck and resonator, so Tom called upon his old friend, Ron Chacey to do that handy-work. The process of building this banjo spanned more than 7 years. Tom Nechville painstakingly digitized and programmed the artwork for production on Nechville’s CNC router and handled all aspects of building and assembly. One particular challenge he overcame is his use of sparkle around the sides of the peghead that matches the binding. Finally in early 2016 she was done except for the finishing touch of finding the perfect bridge, a critical component that often gets overlooked by banjo builders. Tom’s 2016 trip to Israel with his wife and church group afforded him the chance to find some special bridge wood from the Holy Land. Tom’s group was granted special permission to enter the traditional site of the Garden of Gethsemane. The main feature of the garden is its grove of 2000-year- old Olive trees. Upon noticing a small stack of branch trimmings under one fenced off tree, Tom turned his thoughts to whether Olive wood would work in a banjo bridge. Just before exiting the garden, Tom turned around to take a look behind his bench. 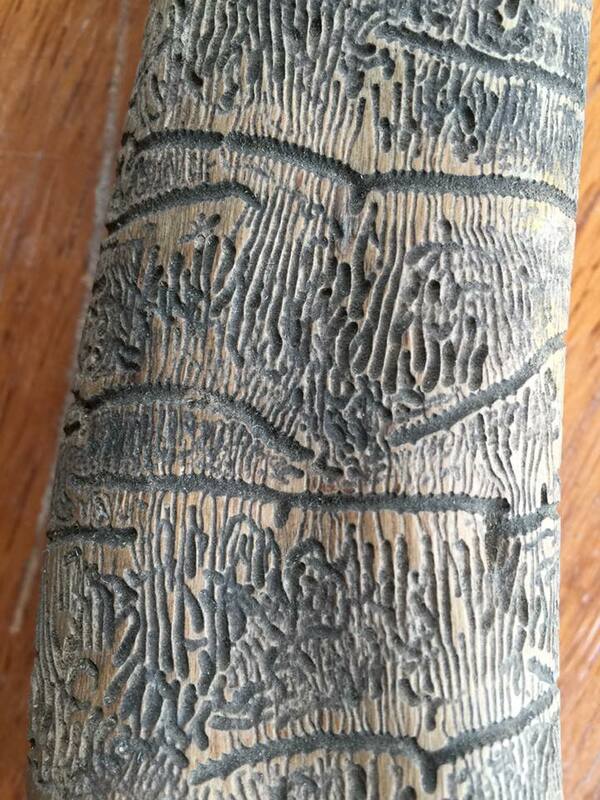 There, bigger than life was a 3-foot long stick with interesting patterns on the surface of the wood just barely wide enough for making bridges. 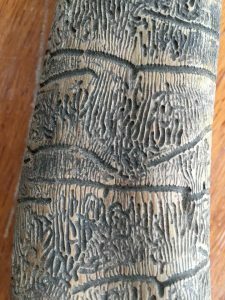 Upon returning to the shop, he found that natural Olive wood did not suit the tonal characteristics he was after for Merry, but that baking the wood somehow gave the perfect result. Merry is a masterpiece to behold and a delight to play. It is on temporary loan at the American Banjo Museum and is currently for sale. Inquiries can be directed to [email protected]. Additional Information about innovative Nechville instruments can be found at www.nechville.com. First I thank my travel mates Al Price, Rick Sampson, Tedd Williams and Lawrence Levine. What a fun crew to hang with. We stayed at the main hotel connected to the convention center. 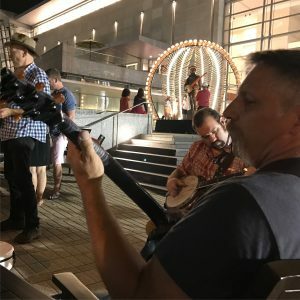 Since the World of Bluegrass moved to Raleigh, the city itself has extended the atmosphere of Bluegrass into the streets. So that even on our occasional walks outside for coffee or meals, we were constantly breathing air filled with Bluegrass. The immersion experience reminded me of our stays at the Executive Inn in Owensboro, Kentucky more than 2 decades ago. Problems and realities of everyday life were temporarily suspended for a week while we lived in a comp letely different world of music. Not just any music, but the kind that is hand-made on the spot between good friends from all around the world. 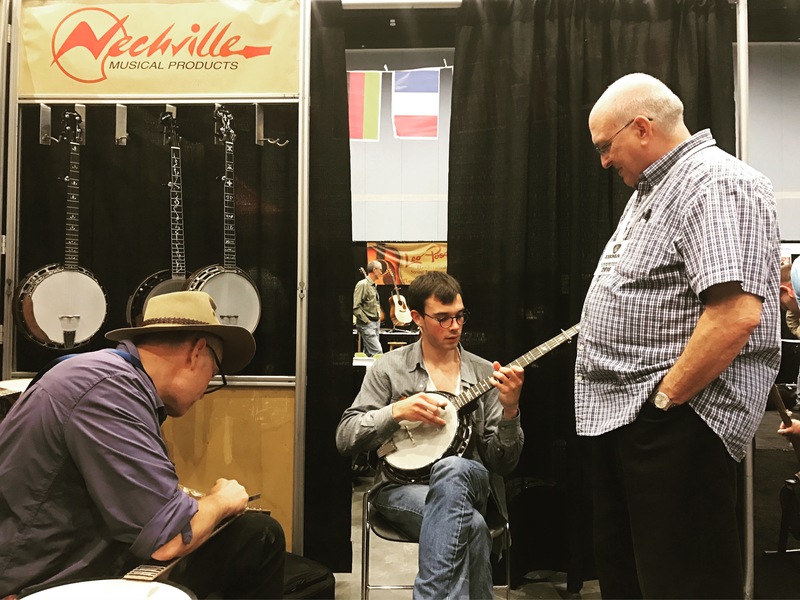 Of particular joy to me as a supplier of instruments was hearing the results of my labor. 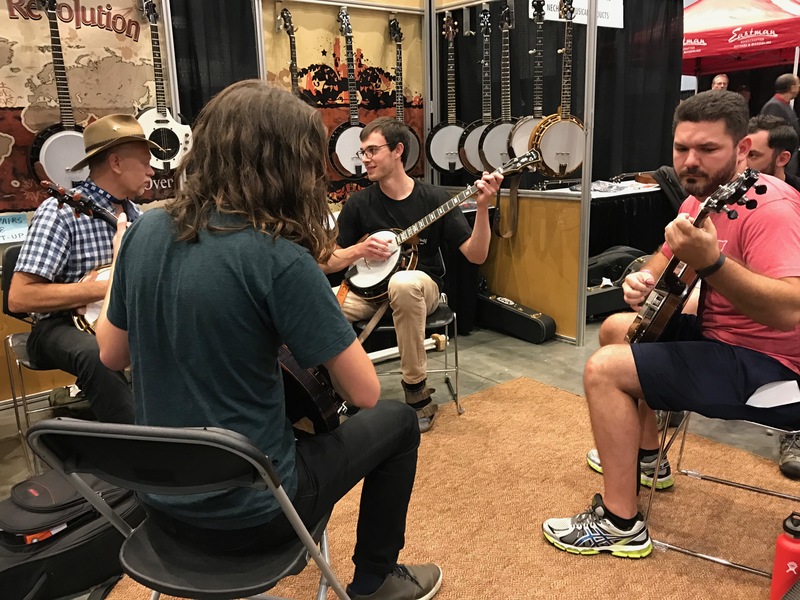 I saw and heard how more and more musicians are noticeably refining their sound with instruments that I have built or set up. Ryan Murphy with Old Salt Union sounded great on his Phantom. Matt Menefee rocked with David Greer. Tim Carter his Bang Bang Band showed their stuff. It was great hanging and jamming with Eric Yates from Hot Buttered Rum, a very entertaining San Francisco group. 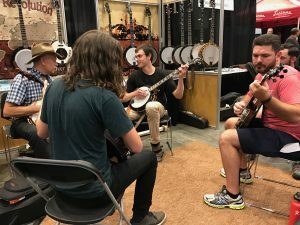 I also met another young band called the Plate Scrapers with Derek Kreitzer on his newly set up Classic. Other notable highlights included Molly Tuttle with Wes Corbett on banjo and Mile 12 with Catherine BB Bowness and her tasty style. 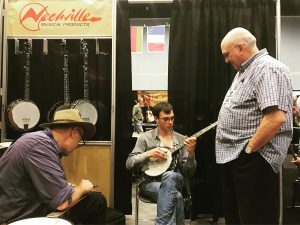 Silvio Ferretti and his group Red Wine has a fantastic new CD that they were promoting, just one of a growing number of International bands appearing at IBMA. The Carivick Sisters from the U.K. were there with Charlotte’s new banjo playing husband John Breeze. John is an old friend, active in the British Bluegrass scene. It is a week worth trying to attend if you have never experienced it. Agents, promoters and professional musicians can’t miss the early week business conference and trade show networking opportunities. 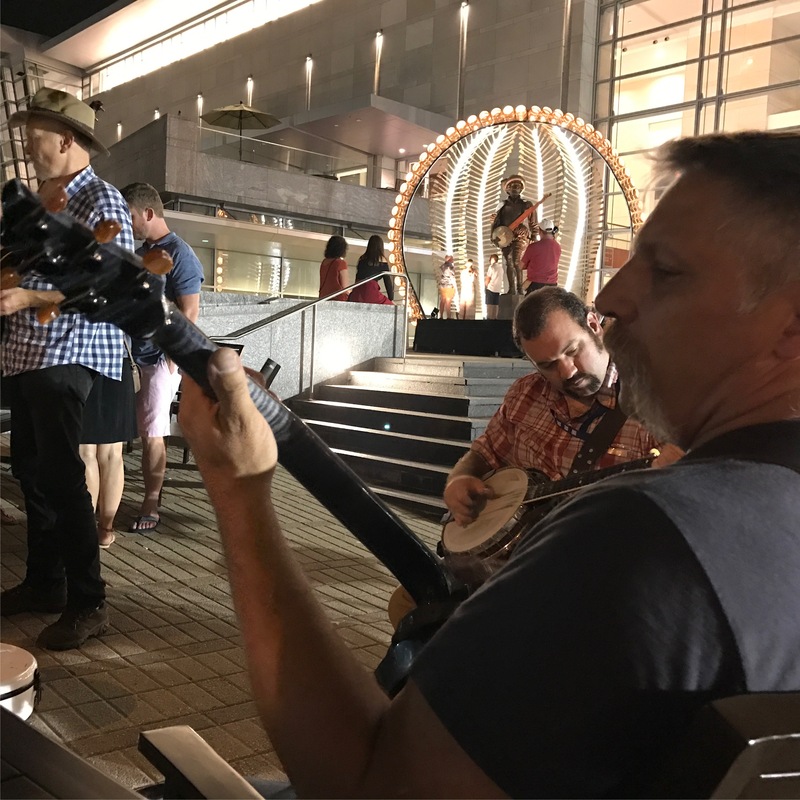 The jammers and fans have plenty of chances through the weekend to participate in some spirited live music all around the town of Raleigh.